Can anybody figure out what's going on? Nobody else seems to have had this problem. Your Motors and Sensors Setup appears to be valid, but I'm having a hard time visualizing your physical robot. Can you tell me how the motors/encoders on ports 1 and 10 are used? Do you really have every motor slot filled? (Trying to recreate your motor setup as much as possible). 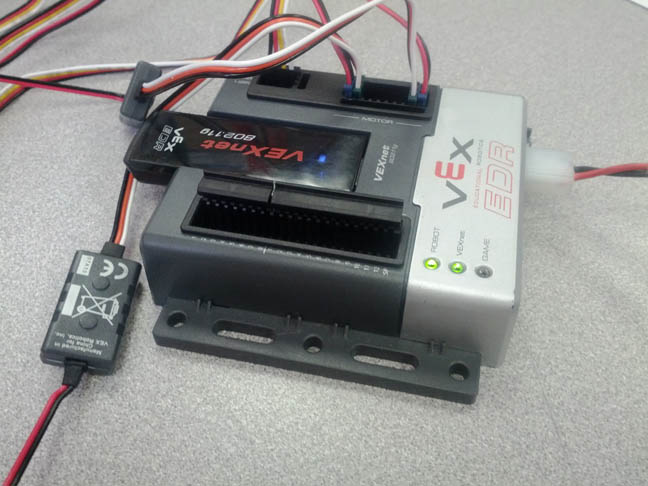 Yeah, we have all 10 ports used up because this is a robot for VRC Gateway. The encoders in ports 1 and 10 are for a sliding lifter system, one on each side. I don't know if it'll make a difference, but we have one of the original Cortexes. I know that there's a while loop that terminates after 30 seconds. After the 30 seconds is over, it still doesn't work. Also, we've been having this problem since before that was added. I snipped a few functions, MoveForward, MoveBackward, TurnLeft, and TurnRight because I don't want to post them on the Internet. If the rest of the code isn't helpful, I'd rather email our code directly to you instead of posting it on the forum. BTW, I'm getting the same slow red blink on the robot light even after downgrading to v.3.05 and upgrading back to v.3.06. I didn't have the same red blinking light with v.3.05. Thank you very much for helping us with this. EDIT: This seems to be a firmware problem because I downgraded to v.3.05 but the same problem and light pattern is there. I would manually download the latest firmware, but the IFI Firmware Update doesn't seem to work for me. It won't start at all. Thanks for posting your code. I ran it using empty versions of the functions you took out, and haven't been able to duplicate the problem yet. - Go to Window > Menu Level > and select "Super User"
It's looking more and more like this issue may require an update to the Master CPU firmware from VEX. I'll keep you posted as we figure out more details. 429.910 Setup serial comm link for 'Open File' at 115.2K baud, parity 'None' completed. It looks like we're running bootloader version 5. Is this a problem? We called IFI as wall, and they said that they didn't have anything to say about this. We're really starting to panic because we have a competition on Saturday and we don't have any autonomous programmed. Boot loader 5 should be fine. At this point, I recommend downgrading to ROBOTC 3.04 for your competition. It uses Master Firmware 3.16 which doesn't seem to have this problem. I consistently get the failure of Robot LED flashing RED when I use 3.06. This error message indicates that the Master CPU and Slave CPU have failed to establish the internal SPI communications link that they use to transfer joystick and motor speed control with each other. I only get the error via Wi-Fi and not with tethered link. When this link is not operational, the Master CPU disable all motor operations. When I load master and joystick firmware 3.16 but continue to run ROBOTC 3.06 Cortex firmware (i.e. version 9.10) the problem disappears. 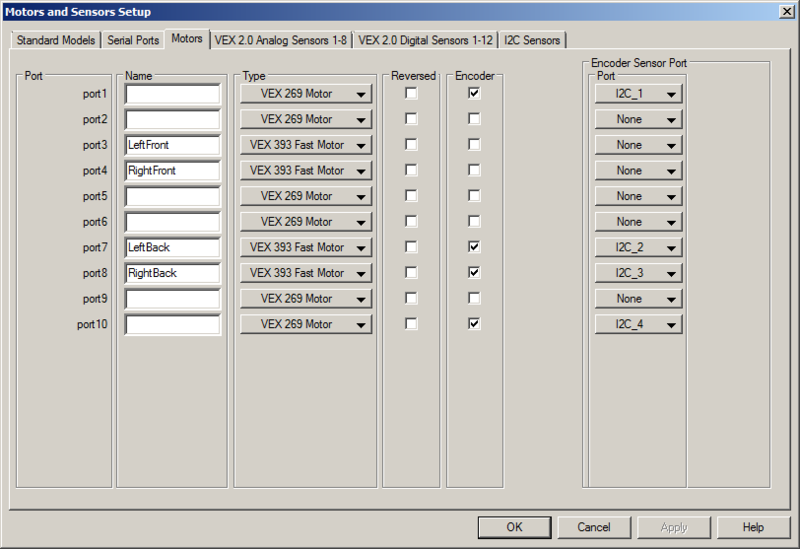 Unfortunately this option is unavailable to non-developers because 3.06 integrity check will not allow you to operate if Master and Joystick firmware are not 3.20; I was able to override this using my PC based development tools to create a modified version of 3.06. Installing 3.20 firmware and problem re-appears. Going to back to 3.16 and its gone. I'm working with IFI's firmware development on quickly resolving this issue. I'll post again when I have more news. OK. Would upgrading to a newer (or different) Cortex resolve the issue? This might also be a lot to ask, but would it be possible for us to use the modified version of RobotC? A different Cortex is unlikely to resolve the issue. I'll work with Jesse on getting a generally available resolution/update available this week. OK. Is there a way to communicate directly with the I2C port so that we can at least use the integrated encoders for Saturday or is version 3.06 required? Simple answer. No. User control of the I2C bus is not supported at present. It is being considered for inclusion in release this summer. We mounted the old encoders and they worked very well for event. Once you have a new version of the firmware, we'd be happy to test it. Sorry for the long delay inbetween posts. We wanted to be positive about the root of the problem before we started sharing information. We'll also be releasing an updated version of ROBOTC with a new Master CPU Firmware and some of our own enhancements. We want to run the full gauntlet of testing before we push out another version, but I expect that we'll have something this week or early next week.